It is an exciting time in human history, for it seems as if everyday continues to bring with it new and exciting breakthroughs and discoveries. This is especially apparent in the research of psychoactive substances, such as psilocybin, MDMA and LSD, and their effects on human psychology and physiology. 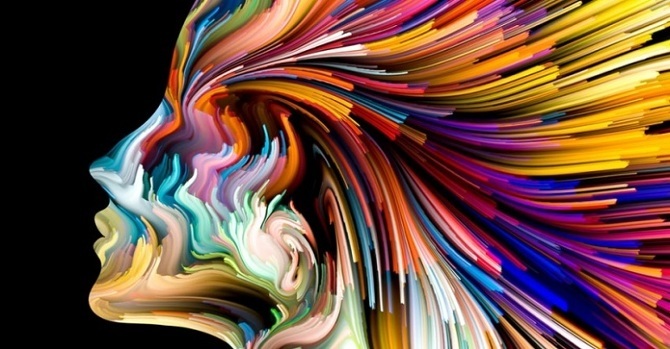 Earlier this week, a research team from Imperial College London and the Beckley Foundation released the first photographic imagery to ever capture the brain’s activity while under the effect of LSD. To capture these images, the team administered either a 75 mg dose of LSD or a placebo to a group of volunteers. Their brains were then analysed using two unique types of MRI scan, as well as an MEG to detect brain waves. The image below is the comparison in the results of the two groups of individuals. 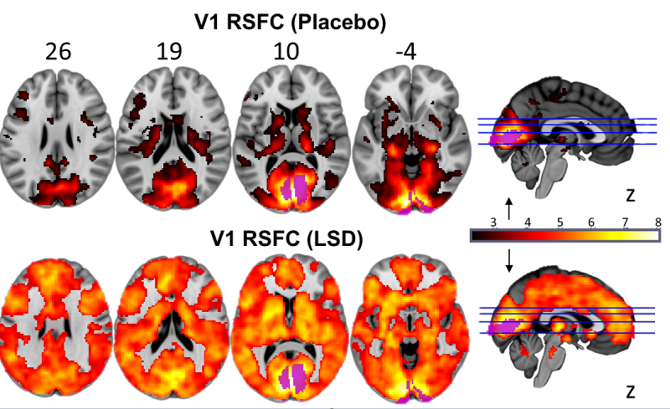 The abundant amount of activity seen in the brains that were affected by LSD serves as concrete evidence of the mysterious link between the LSD experience and mysterious changes in brain activity. At the time of the scans, the individuals that had received the LSD were reporting vivid hallucinations, even in the dark and with closed eyes, that correlated with heightened activity in their visual cortex. Lead researcher Dr Robin Carhart-Harris from the Department of Medicine at Imperial explained: “We observed brain changes under LSD that suggested our volunteers were ‘seeing with their eyes shut’ — albeit they were seeing things from their imagination rather than from the outside world. We saw that many more areas of the brain than normal were contributing to visual processing under LSD — even though the volunteers’ eyes were closed. Furthermore, the size of this effect correlated with volunteers’ ratings of complex, dreamlike visions. These findings, published in Proceedings of the National Academy of Sciences (PNAS), are a key major component that clinical researchers have been waiting for. This photographic demonstration of the quantifiable effects of LSD on the brain presents us with a clearer understanding of the ways in which it may prove effective in treating certain psychiatric illnesses. David Nutt, former chief government drug advisor, was also part of this research team and stated that this work is “the most important thing I have ever done.” It is results like this that are beginning to pry open the “floodgates” to more refined studies and potential medical breakthroughs. “LSD Revealed: Scientific Papers from the Beckley/Imperial Research Programme.” The Beckley Foundation RSS. N.p., n.d. Web. 13 Apr. 2016. Cormier, Zoe. “Brain Scans Reveal How LSD Affects Consciousness.” Nature.com. Nature Publishing Group, n.d. Web. 13 Apr. 2016.